Santa comes early this year at Mississauga's Erin Mills Auto Centre! Join us for our Third Annual Olde Tyme Family Christmas! Friday December 9th, visit us on Motorway Blvd. between Glen Erin Drive and Woodchester Drive in Mississauga. This year's events include main stage entertainment by Childrens Choir, Steelpan Band, plus the main act put on by Canadian Xsports. The Canadian Xsports are the Ultimate Tribute to Canada's Internationally Famous Hit songs, Great music and Bands that are recognized and loved by audiences of all ages. 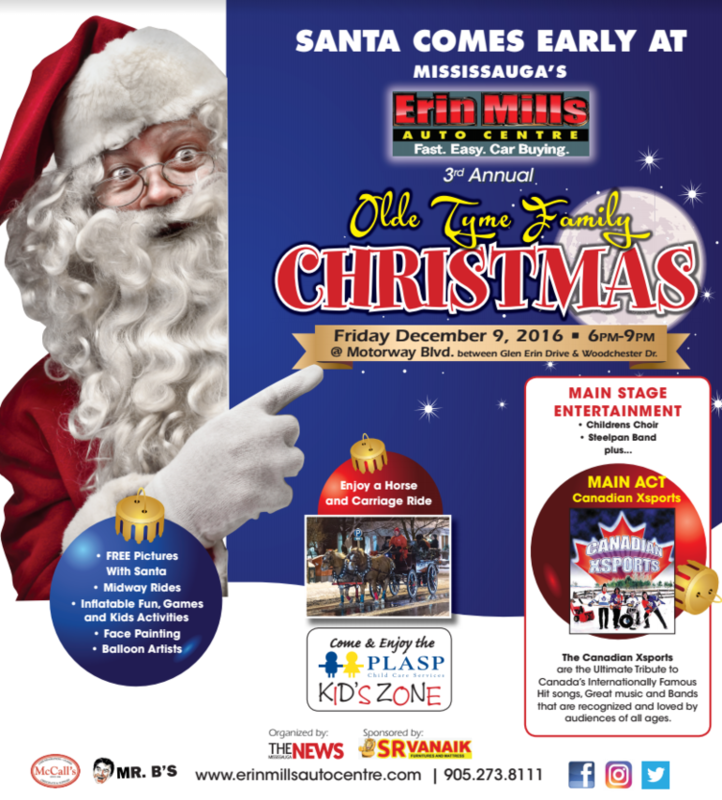 Mississauga's Erin Mills Auto Centre third annual Olde Tyme Family Christmas also includes free pictures with Santa, midway rides, inflatable fun, games, and kids activities including face painting and balloon artists! You can also enjoy a horse and carriage ride. All of this is made possible thanks to our organizers and sponsors. Don’t forget to stop by Erin Park Toyota 6pm-9pm for a cup of hot chocolate!